To send a chat message, start a chat, type your message, and then press Enter. Edit a chat message that you just sent. To enhance your messages, format your text using markup and add emoji symbols. Reply directly to other messages, address specific people in conversations, type commands, and add media to your chats. You can edit a previously sent chat message up to 60 seconds after you sent it. Click Edit next to the chat message or click the up arrow key on your keyboard. A new chat edit window opens. Change your message and press Enter to save your changes. If you decide not to save your edit, press Esc to cancel. If you do not press Enter before the countdown timer reaches zero, the edit window closes without saving your changes. Your changes appear in the chat room with “(edited)” below the chat. Editing a chat generates no new notifications. You can edit the message as many times as you want, as long as your edits are within the 60 second time limit. Note: To edit a chat message, you can also type the command s/former message/new message and substitute the original message with your edited message. When you use this command, you still have 60 seconds to replace your message, but the countdown timer does not display. Click the emoji icon in the chat window. Select a category at the top of the emoji menu and scroll to view different emojis in each category. Press Enter to send your message with the emoji. Note: If you start a chat message with the loudspeaker emoji, then the background color of your message changes to yellow. Use the “@” symbol to mention a specific person in a group chat room and invite them to that chat room. Note: Using the “@” symbol to mention someone in a group chat invites that person to the chat room, even if the chat room is private. Using it in a one-on-one direct chat room does not invite that person to the direct chat room. In a chat message, type “@” and begin typing the person’s name. 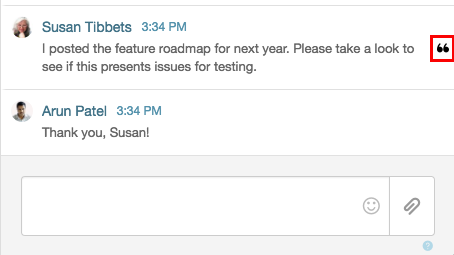 Select a name to address a comment to a specific person or invite them to the chat room. Press Enter to send the chat message and “@” mention. The person’s name displays in your chat message in the chat room. Click the @username hyperlink to open that person’s profile page. Use the quotation mark symbol (“) to quote and reply directly to a specific person in a group chat or private chat room. 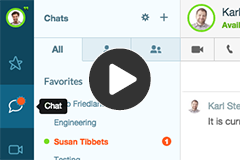 Click the quotation mark symbol to the right of the chat that you want to quote and reply to. In the chat reply window, type your message and press Enter. Your chat message and the original chat message display in the chat room. Chat commands allow you control and add features to a chat room without using your mouse. To use chat commands, type a slash into any chat room and choose a command from the command selections displayed and press Enter, or type all of the command. Press Enter again to execute the command. 苦情 Make a phone call to the person you are chatting with in a one-to-one chat. 「/roll」と死ぬ d および、サイコロ面数の数 Roll virtual dice to generate a random number. For example, type /roll 3d20 to roll three 20-sided virtual dice and generate three numbers between 1 and 20. /presence と存在感 Set your presence to Available, Away, Busy, or Out of Office. For example, type /presence available to set your presence to Available. /whisper @mention メッセージ Send a direct message to a person without leaving the current room. For example, to send a direct message from a chat room, type /whisper @Cooper,Dex Hi Dex! and press Enter. /giphy と検索用語 Insert a gif from the Giphy website. For example, type /giphy cat to select a cat gif from www.giphy.com to display in the chat room. /search and a search term Open the chat room’s search panel and search for a term. For more information about searching in a chat room, see Search chat room history. Send a specific hexadecimal color sample in a chat. Type # and the six character hexadecimal color code. For example, type #66CCFF to show light blue in the chat room. Press Enter to send the chat message. The color displays below your chat message. Scroll to the most recent message. Note: If you are a member of an official group and you close the group’s chat room, the room opens again when someone sends a chat message in that room.